Historically, the word "printing" meant reproduction of images and texts by using a variety of analog printing techniques (letterpress, offset, gravure, flexography, screen printing, etc.). Nowadays, the notion of printing has been expanded because the image and text may be reproduced in electronic media and displayed on different types of screens, computer monitors, readers, etc. Nevertheless, although there are new ways of creating the image, the main problem of printing has remained unchanged. The main problem of image reproduction - independent of the applied reproduction techniques – is faithful color reproduction.. There are two techniques to solve this problem - color management and color matching..
Lettero’s offer includes the color matching equipment, the place of color matching in the entire process of color reproduction requires clarification. 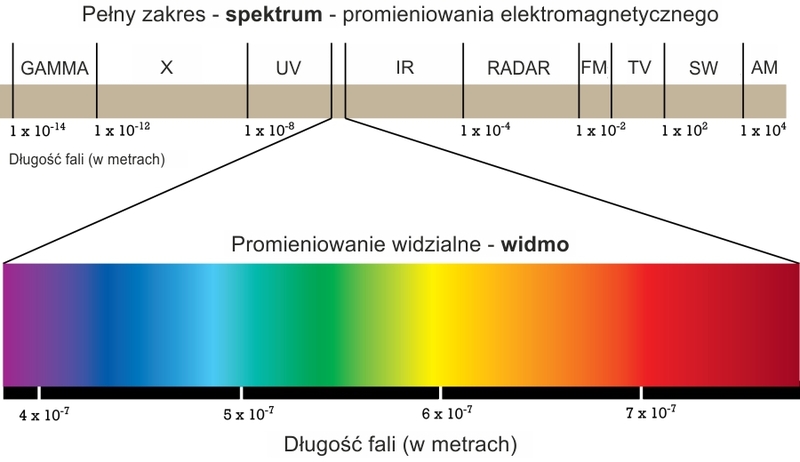 Light is a small portion of the whole range (spectrum) of electromagnetic radiation having a wavelength of 380 - 750 nm, causing cell responses of the human eye and the color impression. Light is visible and therefore this portion of radiation is called a visual spectrum. This range of radiation can be seen by the human eye. Some animals can see the radiation of other wavelengths. The cells of the human eye are sensitive to the wavelength and its energy. Different wavelengths evoke the color impression in the human brain called hue (H). In short, we say that the light of a specific wavelength has a color, e.g. : blue, green, yellow, orange, red, purple and so on. The human eye has cells which are particularly sensitive to the light of three wavelengths corresponding to three colors: red (R), green (G) and blue (B). These colors are called primary colors. The light beam is usually a mixture of different wavelengths to which light-sensitive cells respond differently. The sum of the reactions stimulated by the light of the various groups of light-sensitive cells causes a sensation of color appearance in the brain. If these components are balanced the brain perceives a neutral color. The hue depends only on the wavelength. The hues of the whole spectrum form an image called rainbow. 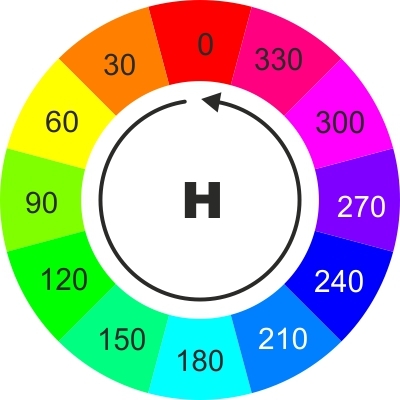 As the extreme colors of the spectrum (visible radiation) have a share of red, in practical applications the hues are presented in the form of the so-called hue wheel. H - hue S - saturation B - brightness, and the impression we call color. 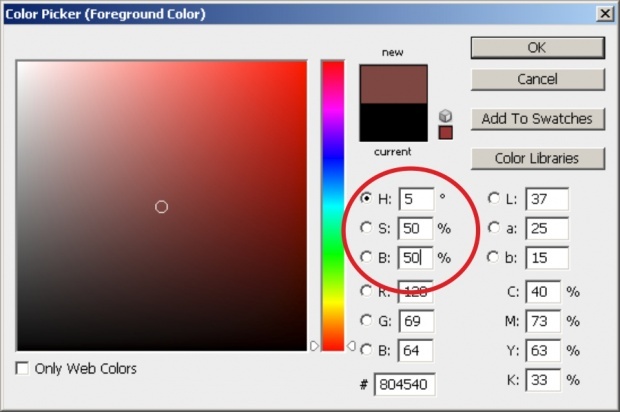 In each computer application program is a tool which offers different ways to define colors, for example including three parameters H, S, B. The energy of the light beam determines the impression of brightness (B). Less energy causes the impression of darker color, higher energy causes the impression of lighter color. The samples have colors of the same hue but different brightness. Each light beam may be a mixture of different wavelengths (different hues). Part of this waves is equilibrated and causes the impression of neutral hue, and only a portion of balance determines the color impression of the entire beam. However, smaller or larger share of neutral hue creates a sense more or less pure color. The degree of purity is called saturation (S). The samples have colors of the same hue but different saturation. The samples have different colors, but equal brightness and saturation. The relationship between the hue and the color is that there are many colors of the same hue (eg. bright red and dark red), but there are no two hues of the same color, i.e. the hue is a parameter of color and never stands alone. Color is the sensation caused by light falling on the light-sensitive cells of the eye. This light can reach the eye directly from its source (bulb, computer monitor, a TV screen), or indirectly, after reflection of various objects (analog images, printouts). The color of light falling directly from the source depends on the parameters of the light itself, i.e. 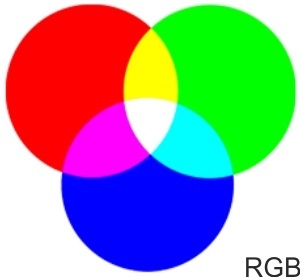 the proportion of overlapping RGB colors. Such a way of producing color is called additive method (addition), and all the colors obtainable in this way create the RGB color space.. In the case of analog images the light coming from the source is partially reflected and partially absorbed, depending on the properties of the individual parts of the image. The inks creating an image operate as filters absorbing the components of the RGB incident light, and the color impression is formed by subtracting the color components from the light. For instance, if from the white (neutral) RGB incident light the image absorbs e.g. red light, then the RGB light results in RGB - R = GB, i.e. : (green and blue). Similarly, after filtration of the G component the result is RGB - G = RB, i.e. red and blue and after filtration of the B component, the light color is RGB - B = RG. Filters (inks) absorbing the corresponding RGB colors make the impression of complementary colors and are determined as Cyan (C), Magenta (M), and Yellow (Y). The way the colors are created by subtracting particular components of the incident light is called subtractive method, and all obtainable in this way colors create a CMY color space. 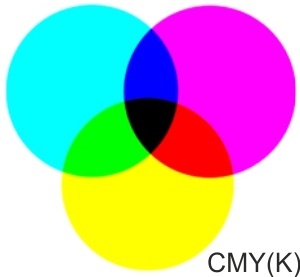 The printing industry, for the technical and economic reasons, uses an additional black color denoted by K (key) symbol, and the color space obtained in print is called CMYK color space..
Because of the specifics of producing colors and material properties, you can create a certain number of colors in each space called a color gamut. 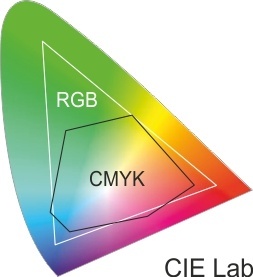 Even the RGB color gamuts of various light emitting devices (monitors) differ from one another, and the gamut of RGB colors viewable by the human eye is much richer than the gamut of monitors, let alone CMYK color gamut. The colors defined in one area may not be present in another space at all, or may not have an exact match. That is the biggest problem in all areas of image reproduction techniques, especially using different methods of creating colors (RGB and CMYK). For optimum color reproduction throughout the entire process of printing (including also contemporary reproduction of digital images on monitors, readers, etc.) a new technique was established, namely COLOR MANAGEMENT. All the colors that the human eye can recognize are defined in the device-independent color space CLE Lab whereas ICC (International Color Consortium) introduced the tables called color profiles associated with each device and printing technology to allow the color conversion between the gamuts of different devices and matching with the most similar counterpart. Color management technique is used for converting by CMM modules (color management modules) the colors between the color spaces of individual devices via the Lab (PCS). For the reasons described above this technique cannot be perfect and there are always differences between the original colors and the colors of reproduction. In addition, there are differences resulting from changes in individual technology and material parameters in every process of production. COLOR MANAGEMENT operates at the level of the software and is independent of the conditions in which the hardware operates. Since, by definition, color reproduction is not perfect, the result of the color management technique is assessed by the human eye by comparing the original (which may be an image on a monitor or an analog image) and test print (proof). On this basis, before starting the print-run, it is necessary to make suitable adjustments. As we already know, the color of an image perceived in the reflected light depends not only on the properties of the inks and substrate but also on the composition of the incident light. 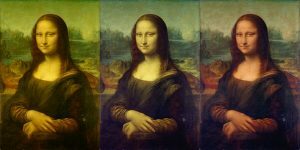 If the same image is illuminated by the light of different composition (different color), every time the reflected light will also be different, therefore every time we perceive different colors of the same image. It means that the condition of proper color control throughout the stages of image processing is to maintain identical conditions of illumination at every workstation. 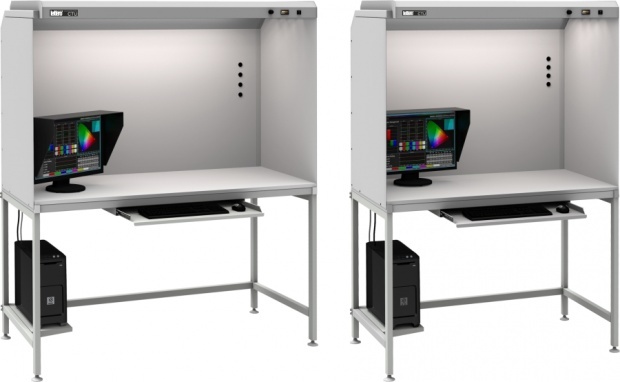 Since in practical applications the parameter defining the spectral composition of the light source is its color temperature (the second parameter is the so-called Color Rendering Index (CRI)), therefore the only solution that provides professional color quality control is to illuminate all workstations with the light that is identical with the test color temperature and high CRI (over 90%) and to isolate such workstations from the influence of other incidental light sources. 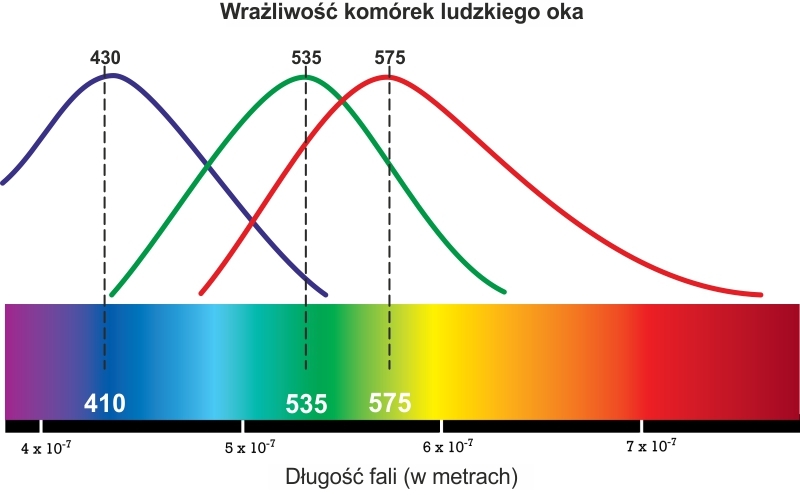 Visual assessment and adjustment of colors is called COLOR MATCHING technique and the optimal conditions whereof is provided by adequate, specialized equipment. The LETTERO COLOR MATCHING program enables professional assessment of the color at all stages and all workstations of the image reproduction - from computer imaging studio to bulk production in analog printing houses (in traditional and digital techniques). Profi view box (PVB) illuminators allow an objective assessment of the color on the analog originals and test prints (proof) in the computer image processing and printing products designing and are used for work at computer workstations which are not protected from incident external light. All the models of the PVB illuminators are equipped with light sources of the test temperature of 5000K (D50), and (depending on the model) with the light intensity regulation and side curtains protecting the evaluated original from incident external light. Color-Match-Box (CMB) Illuminator is a professional device for color assessment of industrial goods and printing products in different lighting conditions. They are used primarily for the presentation and assessment of the products, the most important feature of which is the color, for instance in the design studios, laboratories and sales departments of the consumer goods industries – textile industry (color of thread, leather and fabrics), as well as in the manufacture of footwear, toys, automotive industry, production of electronic equipment, and especially in the printing production of packaging and coating processes evaluation. The most important features of CMB illuminators is isolated workspace that allows assessment of spatial objects in four different types of lighting. CTU color control units are designed to work in a seated position in the design studios and computer imaging studios and preparation of publications, where the constant evaluation and comparison of the colors of the analog originals or a test print (proof) with colors generated on computer screens are most important. Optimal working conditions are ensured by the illumination of the test temperature and the possibility of almost total isolation of the working space from incident spot light. CTU units can be mounted on the existing tables, desks and tabletops, or on dedicated stands with space for computer workstations. CCS - color control units are designed to operate in a standing position and foe controls carried out usually in the machine rooms during the printing process (but also in research laboratories, textile, cosmetic, paint, etc. ), so they differ from the CTU workstations as they have different dimensions and ancillary equipment. Optimal working conditions are ensured by the illumination of the test temperature and the possibility of almost total isolation of the working space from incident spot light. CCS color control units have a great deal of ancillary equipment and are mounted on racks or drawer cabinet bases. CCS-SP color control workstation is designed for visual assessment and color measurement by using a spectrometer on the prints of different format sizes made in any printing technology. The station consists of lamp (lamps) with a test temperature of 5000K (D50), inclined worktop which allows comfortable work in a standing position, a trolley with removable handles for different types of spectrometer, a holder for computer monitor connected to a spectrometer and a frame produced in different versions. LCL lamps are designed to illuminate entire rooms with light at the test temperature of 5000K. Due to such lighting it is not necessary to isolate the separate color control stations of the incidental spot light. LCL lamps have an inner structure of station lamp, but they are equipped with a four ear hangers on the top wall. An extension of the offer of CCS units are the workstations of the width of two CCS-D modules. They have the same accessories as the CCS units and allow providing service e.g. of two adjacent machines in multi-machine halls. Each workstation must allow the optimal performance of tasks under optimal conditions. The optimal assessment and correction of color in printing production requires the creation of control workstations designed reasonably in respect of ergonomics, illuminated by the light of identical test temperature, and isolated from the impact of other incident spot light. cabinets and drawers for storing materials and measuring tools. Final evaluation of color in the whole process of image reproduction is always performed by the human eye. Even high-end electronic equipment does not perform its task if you do not have identical conditions for such an assessment on all stations of the production process. Professional image processing studio equipment should be achromatic (Lch max. 2) and illuminated in accordance with the standard D50 (5000K). 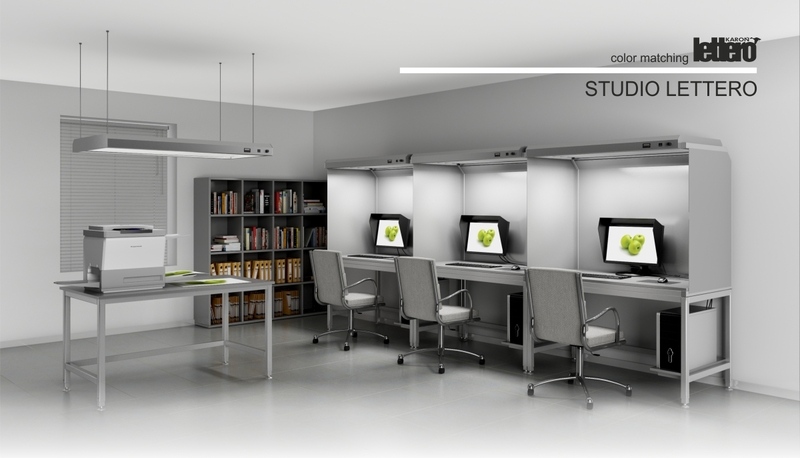 The illustration shows a simple but fully professional studio equipped with lettero devices (LCL, CTU, CTS). Terms of professional judgment of color determines the international standard ISO 3664: 2009. All lettero devices meet the requirements of this standard.